Do you want to convert number figure into text words in Indian Rupees? For example: 1,67,43,920.10 will be One crore sixty seven lakhs fourty three thousand nine hundred twenty and ten paise. If you are familiar with decimal places for crore, lakhs, thousands and paise terminology – then you can easily make such conversion. However, many of us do not bother to memorize decimal places for correct number to words text conversion into Indian Rupee. 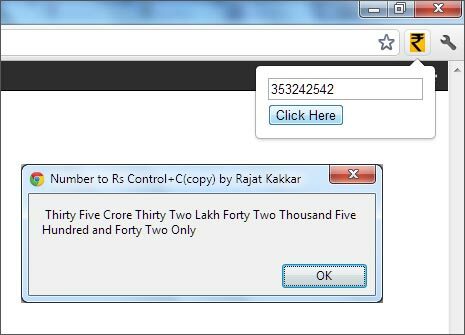 Number to Rs Control+C(copy) by Rajat Kakkar is a free Chrome extension that adds functionality to convert number to words in Rupees within Google Chrome browser. 1. Launch Google Chrome and download Number to Rs Control+C Chrome extension. Once extension is installed, you should see bright colored Rupee icon in the Chrome menu bar. 1. Checkout this article from Microsoft for detailed procedure to convert number into words using Microosft Excel (Office) application program. You need to use custom module for such conversion within MS Excel. 2. You may also use standalone ‘Num to Word’ tool on Windows system. Just enter number and click convert button to get result in words text in Indian Rupees. Unfortunately, you need to register at that website to download this application program.